2010 has been the Year of the Tomato. Our usual cool and somewhat wet Vermont summers are, frankly, a bit of a bust for tomatoes. Here, one plants tomatoes with great hope, and often ends up with shelves full of newspaper-wrapped green fruit at the end of the season. Not so this year. A hot and dry summer certainly had its challenges, but growing tomatoes was not among them! There is a veritable glut of tomatoes going on; no one can really believe HOW MANY TOMATOES there are. Here is where I have to come right out and say that whatever anyone tries to tell you, tomatoes are just an awful lot of work to put up. You’ve got to peel, seed, and chop them no matter what method you choose, then cook them down to various degrees and only then do you get to canning. The typical ‘simple’ cut-up-tomato hot pack turns out to be my nemesis. I like the results (oh, how I like the results for winter stews!) but the project itself makes me crazy. No matter how hard I try, I get either too much juice or too many tomatoes in almost every jar. It is the rare jar that comes out perfect, and for that much work, I want them all to be perfect! And the endless boil for quarts (45 minutes is the current recommendation) is always enough to drive me to drink at the end of a long canning session. So I avoid the cut-up tomato hot pack as best I can. 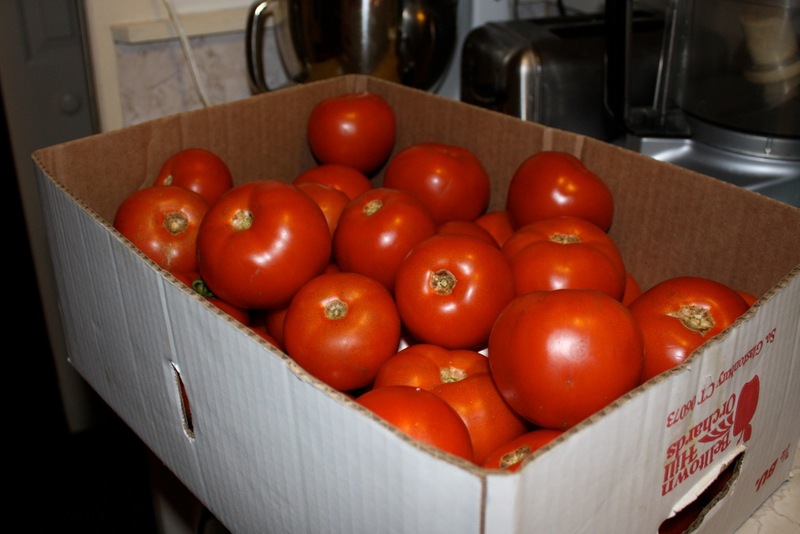 One way around it, if you have plenty of freezer space, is simply to peel, seed, and quarter tomatoes then freeze them packed tightly into quart bags. Thawed, they are just fine for sauces, and I save all the juice I can from the seeds and freeze it separately to add to soups. If you don’t have so much freezer space (and I don’t, alas! The freezer is packed solid already; we’re going to have to buy a chest freezer if we want to buy in any meat at all this fall), you can add some basil and garlic and cook the tomatoes down into sauce before freezing. They get much smaller that way! Or, you can just can the sauce in pint and half-pint jars. Canning a finished product is always more simple to my mind, and because of the long cooking, you only have to boil your jars for 15 or 20 minutes (instead of 40 for the hot pack quarts). 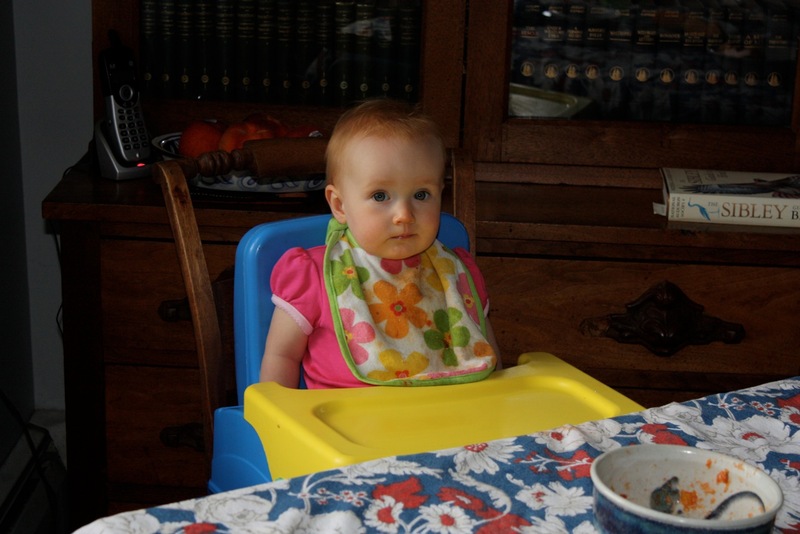 And another bonus, in our house, is that our little 1-year-old gastronome just loves her some fresh tomato sauce on pasta. It’s her hands-down favorite dinner. So I get a happy baby into the bargain. Can’t argue with that! This year there have been so many tomatoes that I have a bit of everything – a few bags stuffed into the freezer, lots of quarts and pints of my imperfectly packed cut-up tomatoes (sigh), and lots and lots of little jars of sauce. And as sick as I am of dealing with tomato guts (oh, I am sick of tomato guts! ), it will be a wonderful winter of eating. Here’s to one or two more canning sessions before it’s all over!